The Dashboard is the main controlling form (Window) and is displayed when the workbook is opened. 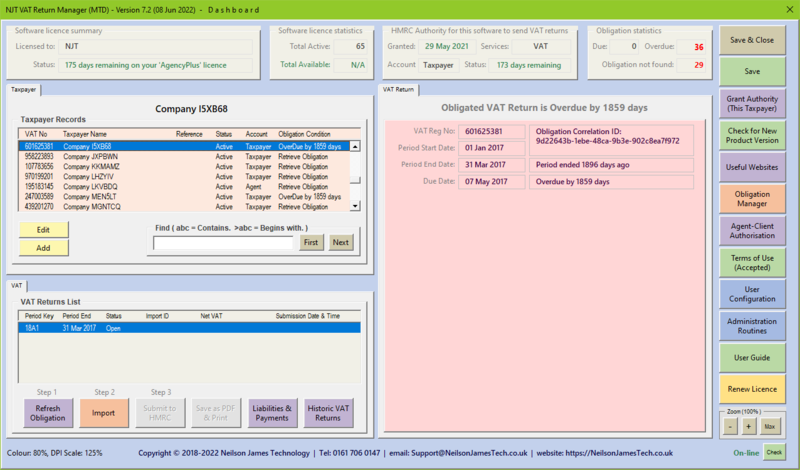 Subsequent forms are displayed using the buttons on the Dashboard. For example: Add a new Taxpayer record, display the Obligation Manager, Print or Save as a PDF document, Renew the Product Licence etc. 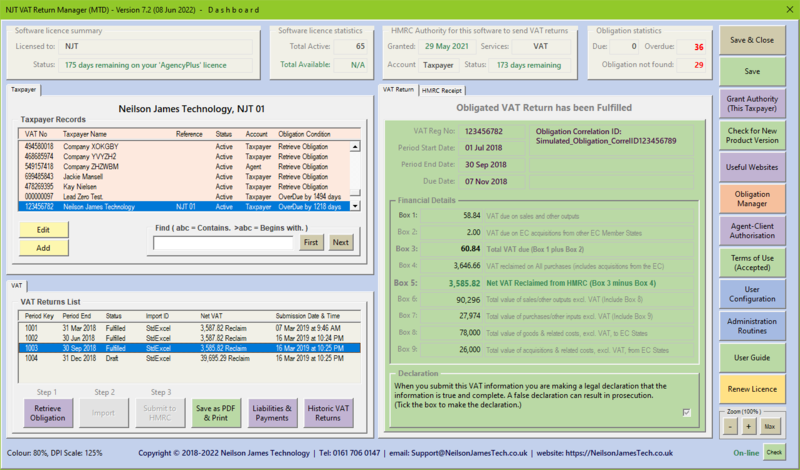 Certain buttons may be displayed or hidden depending on the condition of a VAT Return. Also the button description may change in particular circumstances. For example, the 'Submit to HMRC' button is displayed only when a VAT Return has been imported. Additionally, certain background colours may change depending upon the status of a VAT Return. Then populate the Taxpayer Name, VAT No, Reference (Optional), set Status to 'Active', set HRMC Account Type to 'Agent' or 'Taxpayer'. Click on the 'Grant Authority' button. A Form (Window) will be displayed explaining the process. Select the Services you require then Click on the 'Launch HMRC Website' button. You will be re-directed to the HMRC website, via your default Web browser, and prompted to login then grant authority. When your Authorisation Code is displayed, Click on the 'Copy' button. Then return to this software. Note: When returning to this software you may need to click on the 'Grant Authority' Form before you can click on the buttons. Click on the 'Paste' button. Add any new Taxpayer records where required (Agency Licences only). Select a Taxpayer from the 'Taxpayer Records' list (Agency Licences only). Retrieve Obligation (where not already retrieved). Click on the 'Retrieve Obligation' button. A new obligated VAT Return will be retrieved from HMRC. Note: 1 The VAT Return Status will be set to 'Open'. Import your prepared VAT Return from your chosen source. Click on the 'Import' button (The Import window will be displayed. Select the Import Type from the drop down list. Locate the desired file, via the browser, then click on the 'Open' button (The details will be validated). Note: The VAT Return Status will be set to 'Draft' and the file location will be saved for the next time you import a VAT Return for this Taxpayer. Submit your VAT Return to HMRC. Make sure you tick the Declaration Box. Click on the 'Submit to HMRC' button. 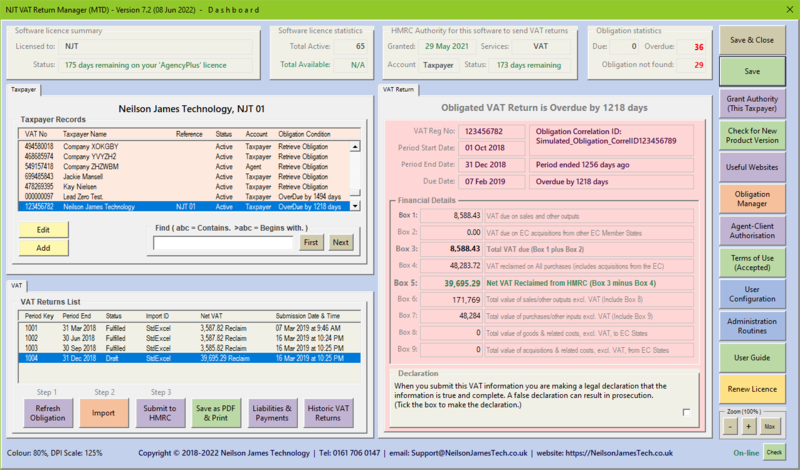 Note 1: When complete, the VAT Return Status will be set to 'Fulfilled' and the 'HMRC Receipt' Tab will be displayed. Note 2: This Routine also prompts you to retrieve your next obligation. Print VAT Return or save as a PDF file. Click on the 'Print or 'Save as PDF' button. Select 'Print or 'Save as PDF' from the Option buttons. Note: PDF documents are saved, by default, to the sub folder '\Receipts'). However, you may change the default folder location for each Taxpayer via the 'Change Folder' button.